We offer an array of fresh fruits and vegetables as well as a variety of portion packed individual servings, which provide a healthy solution for school nutrition. Our portion packed products are always fresh cut, no preservatives, convenient, healthy, and ready to eat for snacks or lunch side dishes. Our objective is to support the local agricultural economy, and reduce the environmental impacts of long distance shipping. We support the Farm to School Initiative by sourcing fresh fruits and vegetables from local farms. We thoroughly understand the Buy American provision and their goals to support Child Nutrition Programs, which is why we’ve taken the extra step to assure you stay on track. View or download the following below for more information and links about the Buy American Provision. We have partnered with Sesame Street to teach kids about the wonderful and colorful world of fruits and vegetables around the globe. The Eat Brighter program gives you and students a unique look into the diverse world of fruits and vegetables. We promote local, sustainable fruits and vegetables, and specialty produce from around the globe to your district at NO COST to you! 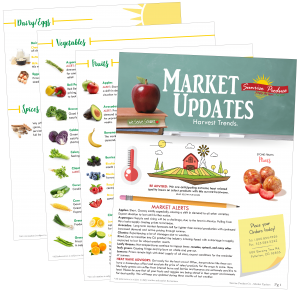 Each sheet is tailored to a specific product and gives helpful information, so kids can engage and learn while eating healthy! Include us in your next Bid! Fresh options and healthy solutions to help you meet USDA standards. We can assist you in utilizing your school commodity programs to the fullest. School service is enough to handle, let us take care of informing you about the industry’s constant market changes and alerts. From updates, alerts, and best buys! Sign up to receive this information straight to your inbox.